Funko unveiled four officially licensed horror Pop! vinyl figures coming to four different retail outlets exclusively this Halloween season, including a new blood splattered version of Michael Myers. 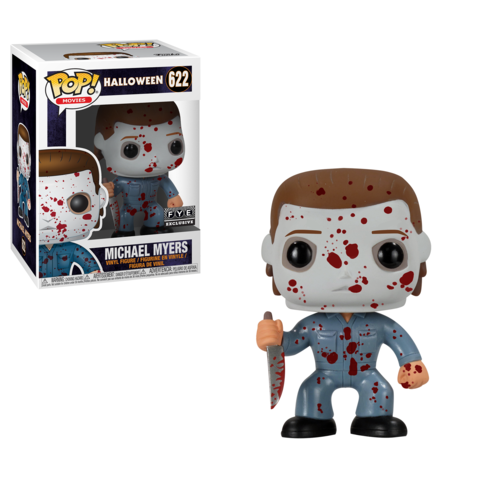 The new bloody Michael Myers Pop! figure will be an exclusive at FYE stores. Other horror Pop! figures announced for 2018 include “Baghead Jason” from Friday the 13th Part 2 available exclusively at Walgreens, a black and white Pennywise from the 1990 It available exclusively at the Rhode Island Comic Con, and a neon green Cthulhu available exclusively at Books-A-Million. All four new figures will be available this fall. While we still hold out hope for a Michael Myers Pop! figure from Halloween 2018 (or other characters from the franchise like Laurie Strode, Dr. Loomis, and Jaime Lloyd), how many of you will be adding this bloody new addition to their collection?